Security was very tight around the capitol. The streets were empty of tourists. I returned to Washington DC over the Memorial Day weekend. 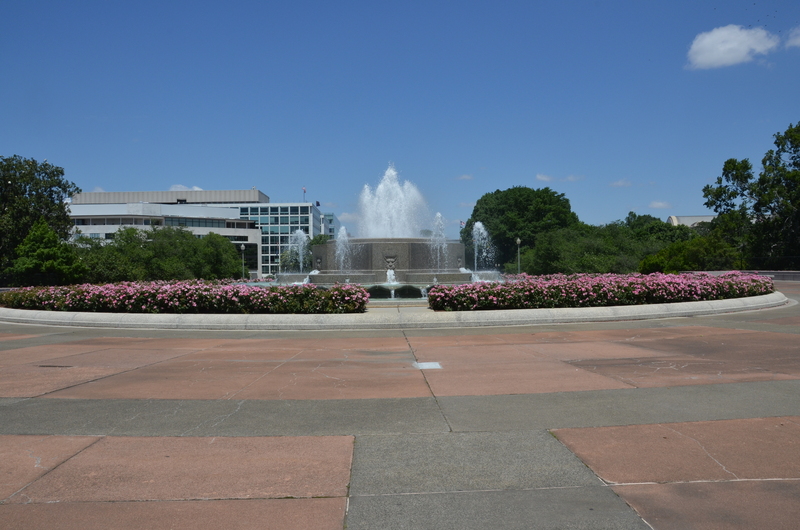 It was an opportunity to experience the many changes time and terror have made to the original concept of making the West Front of the Capitol Building a grand lawn for the nation to celebrate major patriotic events. 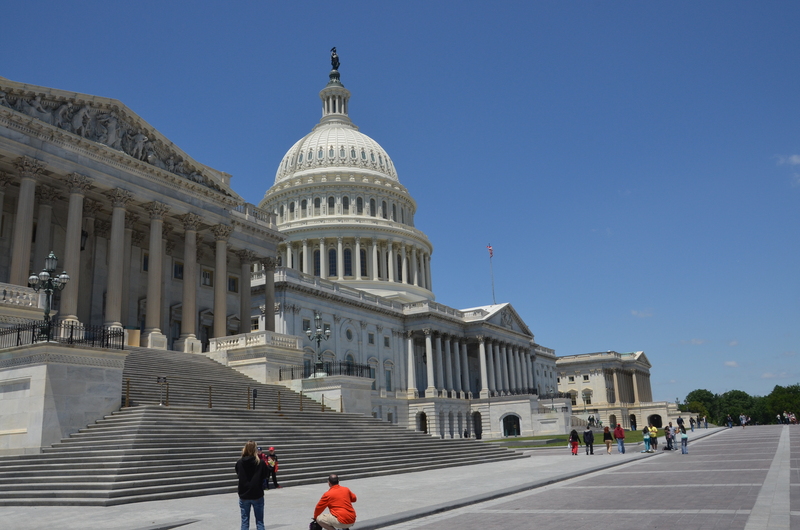 The name of the organization is The United States Capitol Historical Society. 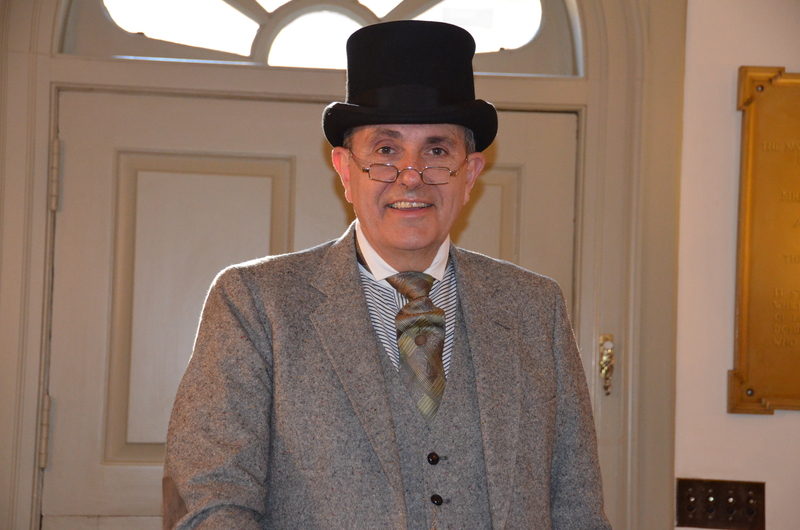 Their Chief Guide and Public Programs Manager is Steve Livengood. He led us on a merry route around the perimeter of the grounds. 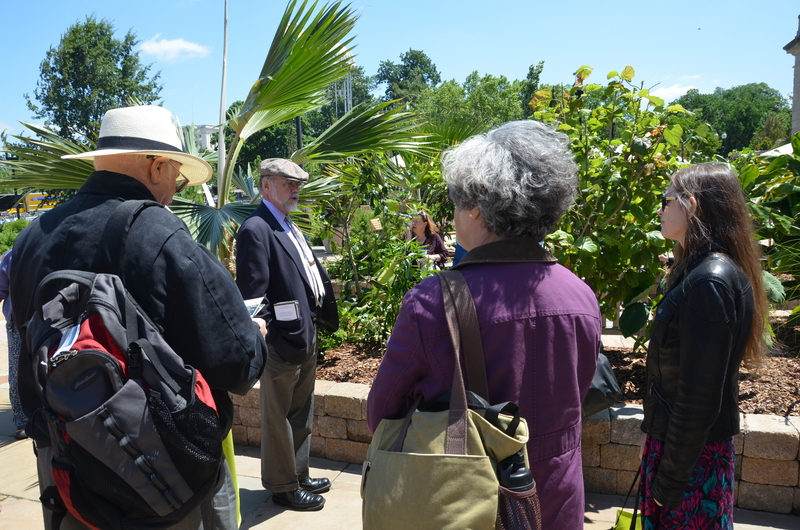 Beginning on the terrace of the terrace of the US Botanic Garden, the tour headed east towards the closest access to the lowest level of terracing on the mall side of the building. A sprawling stage had been set up fronting a massive sail of canvas and bunting. The majestic lawn of the West Front was surrounded by a bulwark of orange tapes, traffic barricades and official police presence. 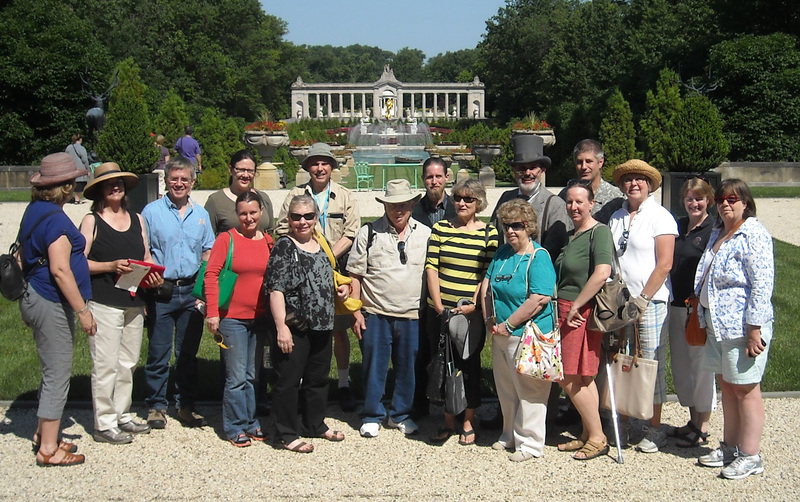 The group accompanying me posed for a photo on the landing dedicated to the fallen heroes of the Civil War. Memorial Day Splendor in the nation’s capitol. It’s known as the Grant Memorial. I knew U.S. Grant. After his presidency. During the scandals that came afterward. I was with him in New York as he was writing the memoirs that would support his family after the cancer completed its course. He was a great man. The Memorial is monumental but it is still not as grand as the man. His life was perfect for his time and his place. He delivered the Republic back to the hands of the people. It was an auspicious location. It was also the closest we came to viewing the work for which Olmsted and the partnership is famed. On our groups approach, guards came forward to prevent us accessing the lawn and terraces. The closest the tour got to the capitol terraces. 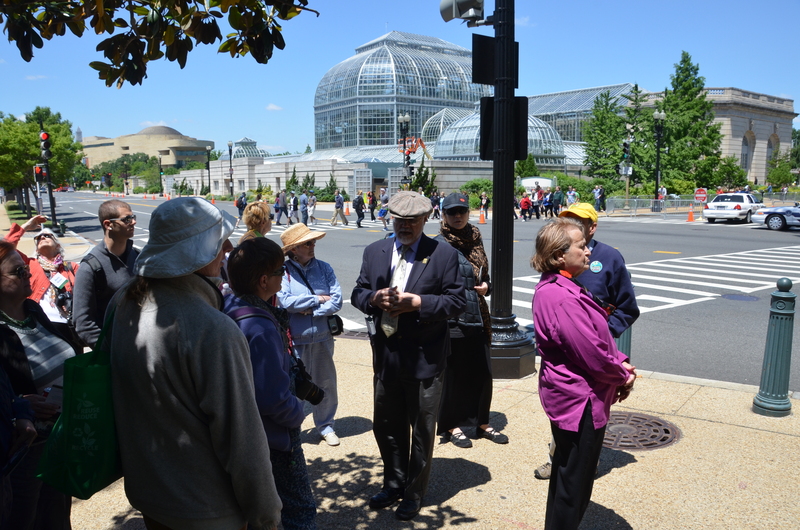 Steve decided to walk and talk our way along the south façade and past the Rayburn congressional office building on Independence Avenue. We heard about the plan to open up the true “front” of the building as originally envisioned by Pierre Charles L’Enfant. He was French but wanted to be known as Peter when he was working on the original plan of the city. 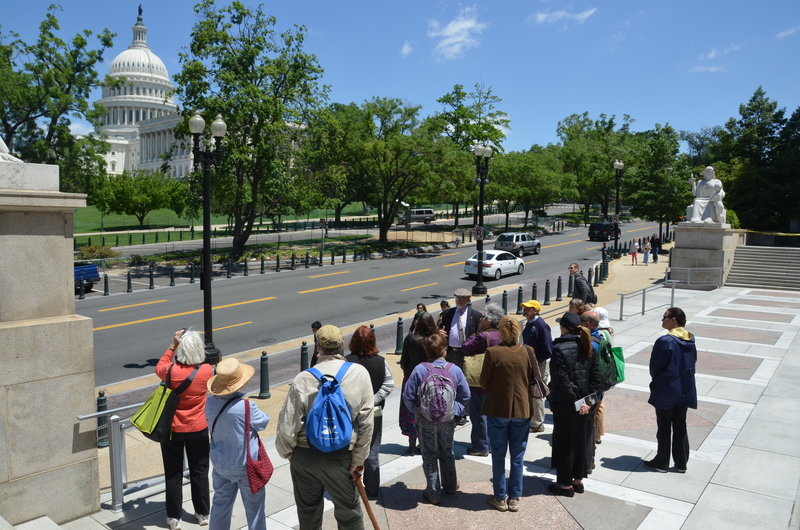 The tour stops on the steps to the Rayburn Office Building across from the South terrace of the Capitol building. Imagine the designer putting plans on paper for a city of 500,000 people when the site was mostly a tidal swamp prone to culturing more mosquitos than people. His vision was grander than Paris or London in its time. He had a blank slate on which to write historic large letters dedicated to the majesty of America’s great political Republic. Not since Roman times had such power been wielded by the general public. As with most singularly unique concepts, the design languished in the control of three commissioners. L’Enfant was replaced after the site had been surveyed and pinned. The streets were run but it would be years until anyone could see visual supremacy of his populated capitol. The East Front of the US Capitol Building before the bomb squad arrived. 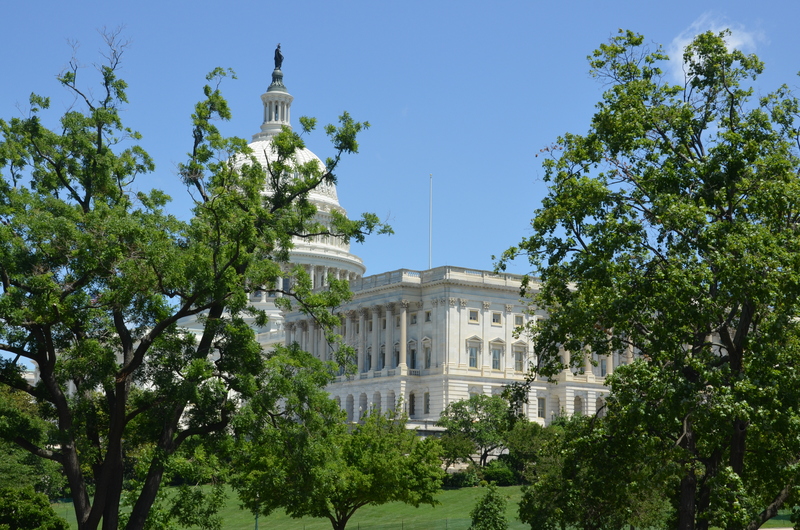 The building housing our bicameral house of legislation grew by needs and starts. Senate and House added wings. The dome was finally completed. But the main entrance for its first 100 years of existence was the East Front. The mall was cut out of a city built up of blighted tenements and squatter’s shacks. The museums came later to save the avenue that now connects the Capitol with the Washington Monument. 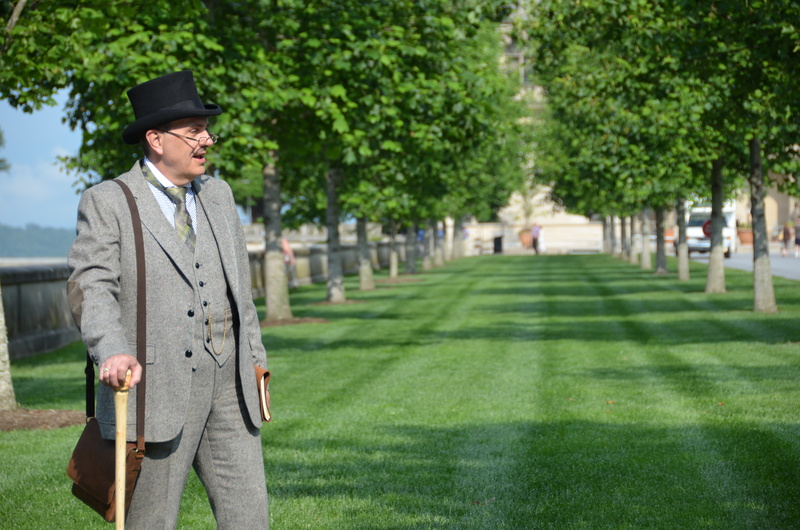 The tree-lined avenues edged with marble-faced buildings that a casual visitor now experiences around the Capitol were unknown to President Lincoln. Somehow L’Enfant’s vision, although 200 years in the creation, was fulfilled with the energy and strength of children four or more generations removed from the fountainhead. 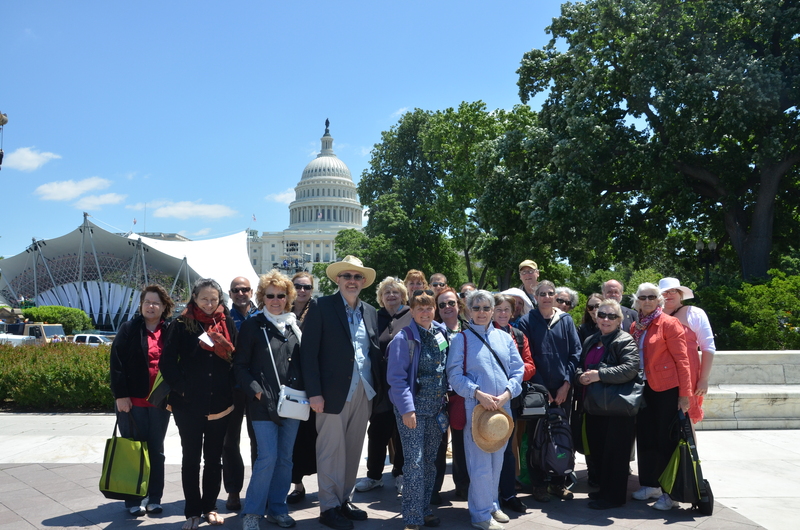 Our tour group reached the top of Capitol Hill. We walked around the cordon of security barriers. Access to the building was blocked. 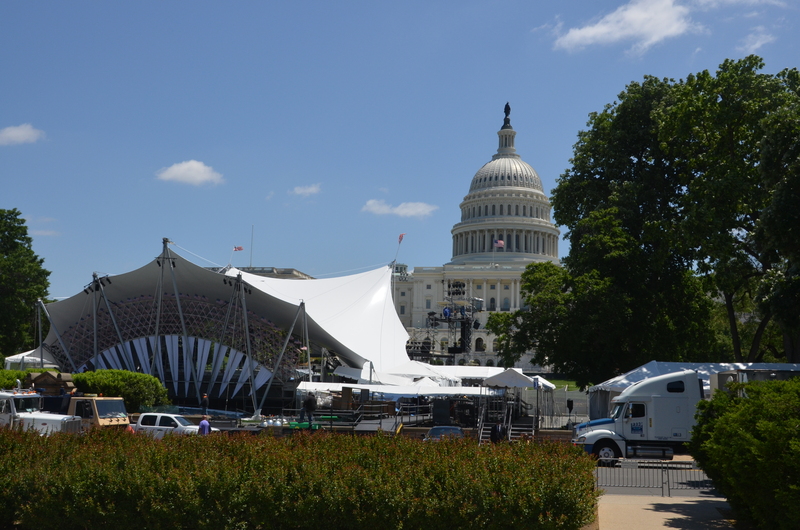 We could hear music played by the National Symphony. We stood silent as a big-voiced soprano added conspicuously extraneous notes to the singing of the Star Spangled Banner. I hummed along. I stood proud as I viewed all that had been created. I was reconnected to being an American. The times have changed. Events are larger than architecture. No one notices a man in a top hat with memories of how it used to be when the nation could have an uninterrupted party on its front lawn. Happy Memorial Day. I remember other events held on the same anniversary. But I continue to feel just as proud to be able to say, “I am an American.” I thank Steve Livengood for reminding me how important and unique that is. Nemours Mansion and Garden on the longest day. “Can’t repeat the past?…Why of course you can!” F. Scott Fitzgerald. The Great Gatsby. “Do you ever wait for the longest day of the year and then miss it? I always wait for the longest day of the year and then miss it!” F. Scott Fitzgerald. The Great Gatsby. 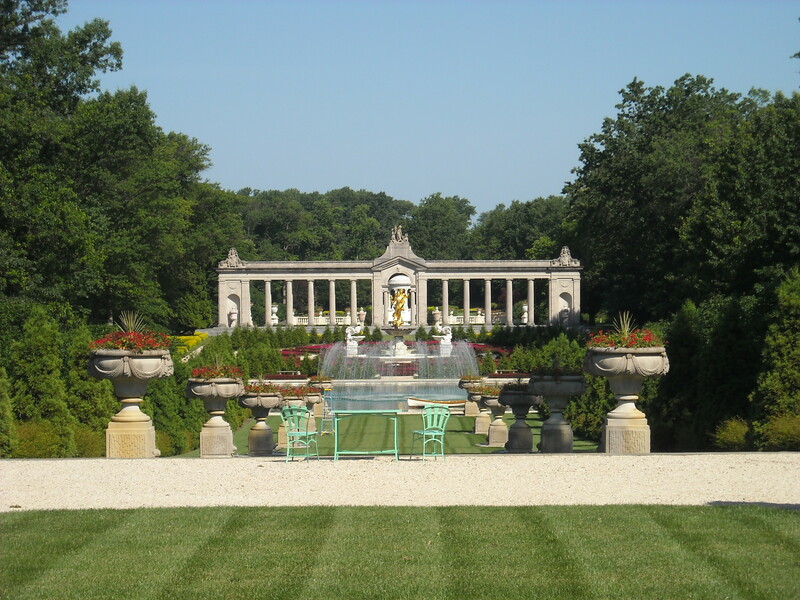 The terraces at Nemours descend to the pool and the formal colonnade. It was a trip that took only a few hours. Arriving as we did on a morning of exquisite sun and warmth, we looked forward to a day that included garden tours, architectural design, and reasonable expectations for working ideas. As the day opened, we knew that it was the summer solstice: the longest day of the year. And we had the added pleasure of experiencing it in magnificent surroundings. How many hours does it take to turn clocks back to the years before our memory? The tour included the dining room. The table was formally set and inspected by the royal gaze of a Louis in a gilt frame. The tour started with a walk down a corridor filled with dates and photos of major events. It was a walk through the history of newsmakers that ran parallel to the lives of those we would get to know. The trail down history’s lane led us to a theatre. A movie told biographical details of a privileged life beset with major emotional obstacles. 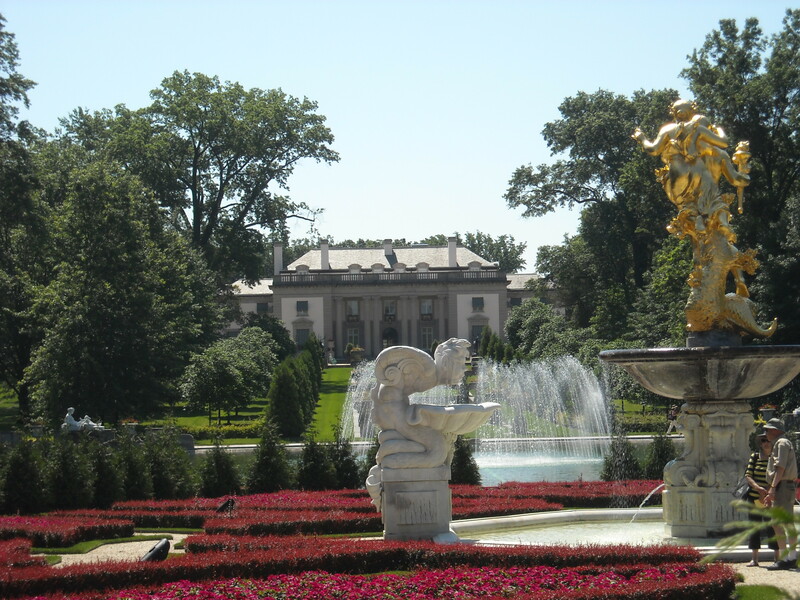 Nemours Mansion and Gardens is an estate that recreates a gilded age of 18th Century French landscape design with a not a little help from Louis XVI’s architectural apotheosis at Versailles. It was built during our own gilded age of industrialism, technology and unlimited dreams. It was finished at the height of our Great Depression. The Pool was stocked with a row-boat for the pleasure of the children swimming. The house is a model built for a second wife who loved everything French. She obviously had the wallet of A. I. Dupont available to satisfy every small detail. The lavish interiors are crammed with French art on the walls, stuffed in the curio cabinets, and carpeting the floors. Incredible examples of authentic, period-correct French furniture glow with gilded patina and petit-point needlepoint. The dining room table expanded under the gilt-framed gaze of a royal Louis. It was set with porcelain nymphs frolicking around fresh flowers, candles, crystal, silver, and Meissen. The chandelier over our heads was said to come from the Schonbrunn Palace in Vienna. Marie Antoinette would have recognized it from her childhood in that city. 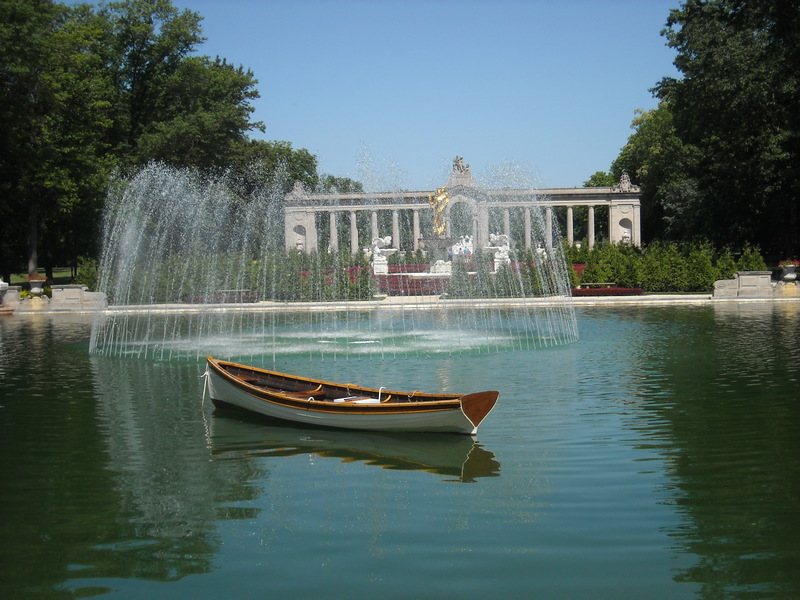 Also, the Schonbrunn had a “French” landscape designed by a disciple of Andre Le Notre–Versailles garden designer. Outside the front door, a gravel terrace separates the formal architectural block with a series of descending lawn terraces. The lawns are pristine. No sheep shearing. The shearing is left for the borders on either side. Cryptomeria japonica ‘Yoshino’ create exclamation points of interest. The low-trimmed shrubs connecting the points are Stephanandra incisa ‘Crispa.’ It’s an elegant shading of color down the allee, even if it requires incredible attention to cutting and shaping. The statues that surround the pool are marble in the French monumental tradition. The larger-than-life-sized “Achievement’ is gilded with 24 carat leaf. 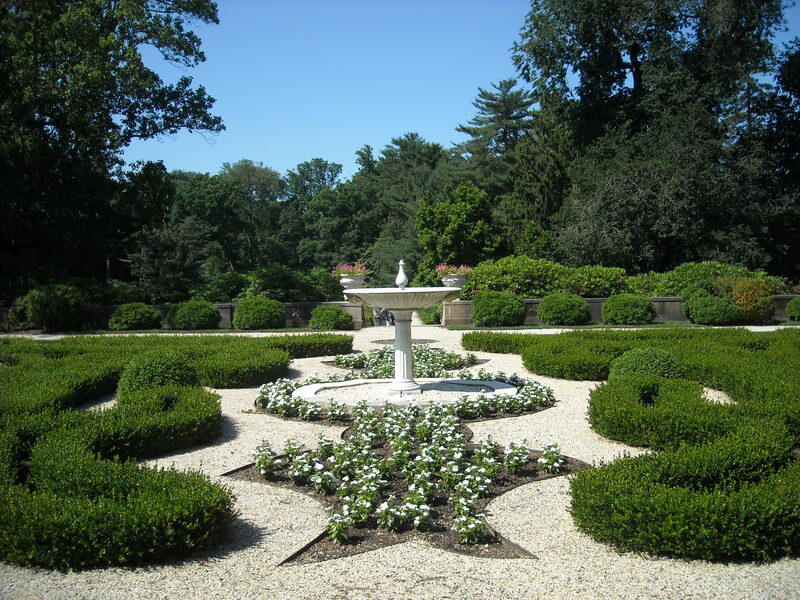 It is centerpiece to the formal parterre of colored annuals and trimmed Buxus hedges. The entire transit of house, garden, terraces, and history left me in a very contemplative mood. 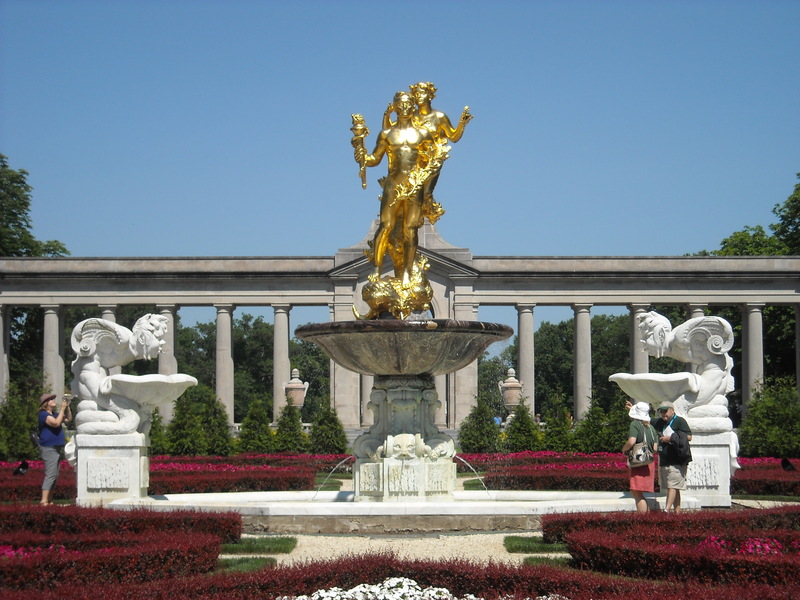 I didn’t walk as far as the Temple of Love with its great French bronze statue of Diana, the Huntress. At the end of this longest day I was haunted: with the vision that crafted this elegant life. Great cubic yards of soil were moved to create this wonder. As with Central Park, the moving of earth is necessary when landscape art is created. Instead of brushes and canvas, the artistic effect is made with swaths of brilliant plants and sparkling marble. The glitter of romance is enhanced with tinkling cascades and shimmering pools of water. The trees that surround the major axis of landscape work wrap up the site with bordering green and fool the eye into thinking that it can’t escape from the magic of the natural artifice. This dream-like visit on this longest day came to an end before many of us achieved the final vista. 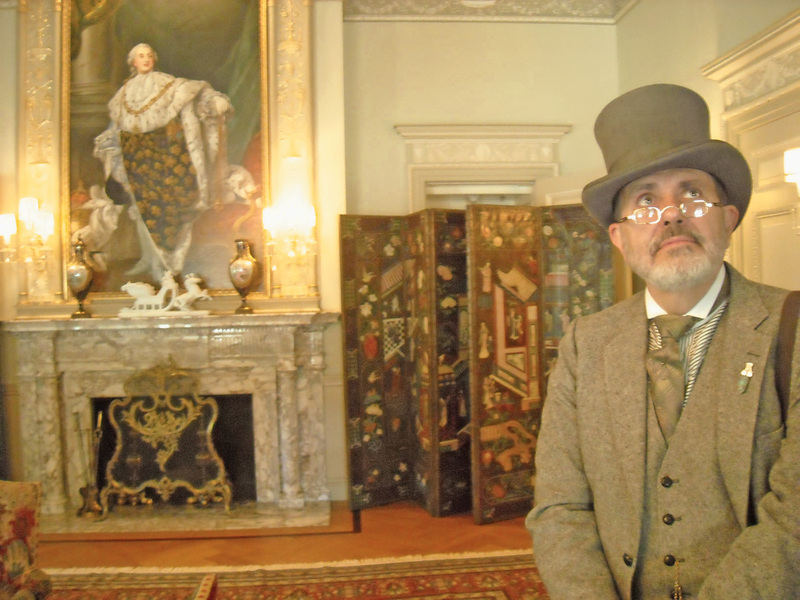 We traveled on to the next garden and a brilliant visit a DuPont brother collector of Americana. I recall a quote from a former neighbor of mine. She wrote of a time in our lives when we were remembering war and yet lived to experience a better world. Longest day? Longest night? “The longest day must have its close–the gloomiest night will wear on to a morning. An eternal, inexorable lapse of moments is ever hurrying the day of the evil to an eternal night, and the night of the just to an eternal day.” Harriet Beecher Stowe. “It is good, big work I have in hand!” Frederick Law Olmsted at the start of his work with United States Sanitary Commission, the forerunner of the American Red Cross. 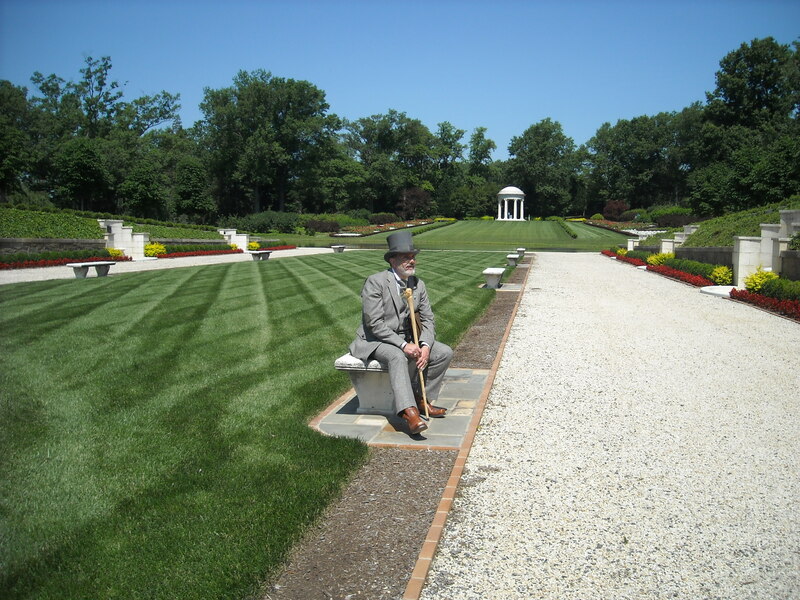 He was its field superintendent during the peninsular campaign for the Army of the Potomac during the Civil War. Taking long walks, rambling, has been a life-long activity for me. There has never been a forest, stream, mountain, or field that has not called to me to investigate, measure and redesign. Olmsted in the formal allee at Biltmore. “From this gentleman’s practical training as an agriculturist, His horticultural writings, His talents and character we believe him eminently qualified for the duties of the office of Superintendent of The Central Park New York.” —Washington Irving, and the members of search committee. 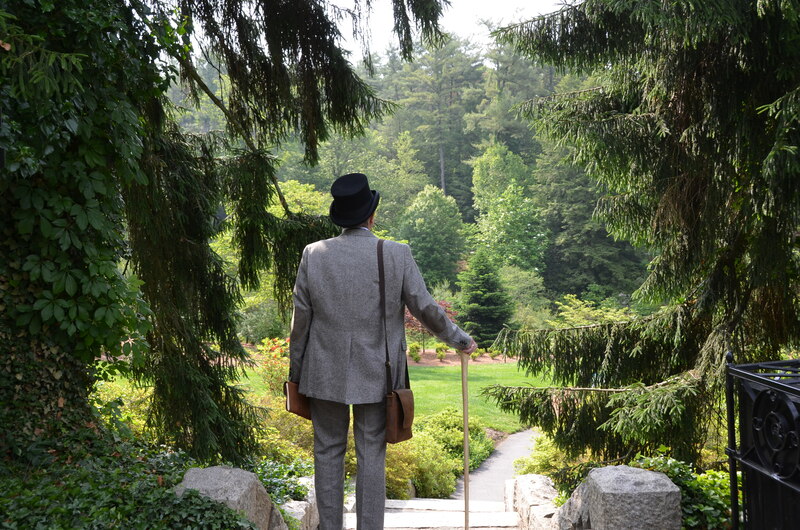 “I’m 36 and starting a new career.” Frederick Law Olmsted at the start of his employment on the Central Park Project. 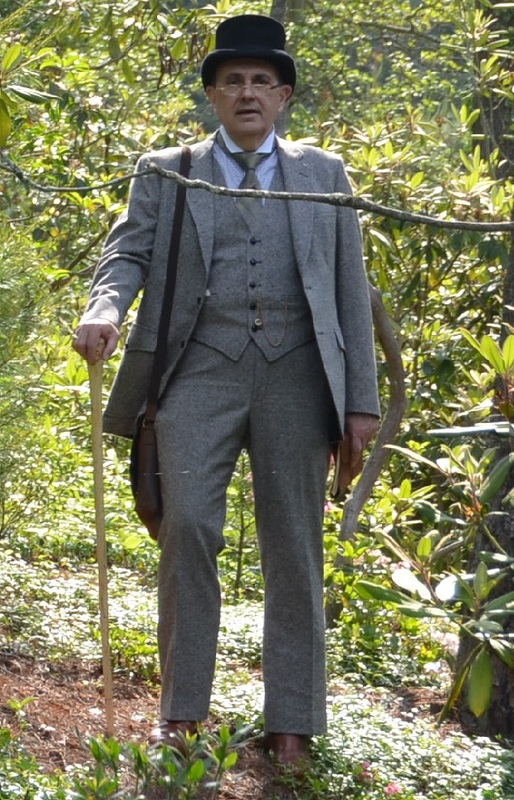 Olmsted never tires of his countryside rambles. All of them are differing views to his unique perception of nature.